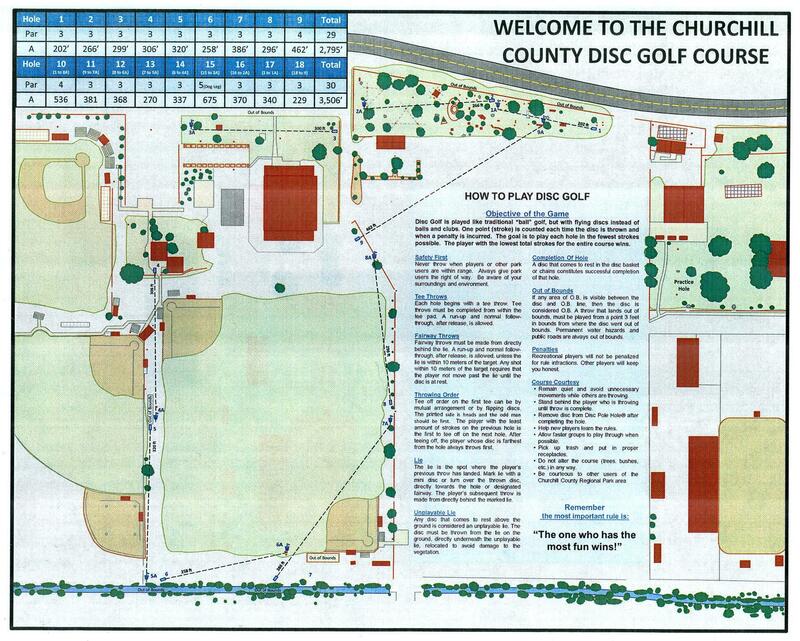 Churchill County is happy to introduce you to the Churchill County Disc Golf Course. The course was built in 2015 thanks to the efforts of Timothy Shurtliff. Tim helped make this project a reality as part of his Eagle Scout project. As of today, it is a 9 hole course that is open to the public. You are welcome to come play at any time, but be aware of your surroundings while playing as their may be other people around the course including vehicles. As well, 2 holes go across sports fields, so please be aware of children playing on the field. Discs can be rented at the Parks and Recreation office located at 325 Sheckler Road for those who do not have their own discs. The fee to rent a set of discs will be $5. If you have any questions, please contact the Parks and Recreation Office at (775) 423-7733.